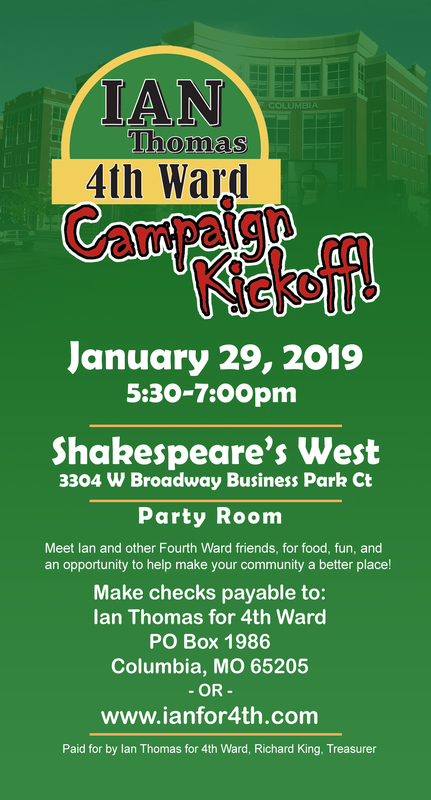 Please join me this Tuesday, January 29th, 5:30 - 7:00 pm at Shakespeare's West (3304 W. Broadway Business Park Ct.), for my Campaign Policy Rally. Since I am unopposed for re-election to the Columbia City Council, this event will be less of a fundraiser and more of a call to action on policies that will advance good planning, social and economic equity, and transparent government. There is no expectation that anyone should make a campaign donation, so save your money and come on down to enjoy free pizza and conversation about how to ensure Columbia is a place where everyone can thrive! First of all, we need to start planning for growth instead of waiting for it to happen and then reacting! How fast do we want to grow and what will the Columbia of the future look like? Should we just grow forever or will we create a vision for a city of a certain size - both in terms of population and land area? And how shall we pay for all this expansion? How are we paying for it now? And, second, we must all take the time to understand how hard it is for so many of our neighbors to get through each day. About one-quarter of all Columbia residents live below the federal poverty level and almost one-half of children attending Columbia Public Schools qualify for free or reduced lunch. This situation is not something to be proud of, and we should challenge ourselves to correct it! What type of law enforcement program will support struggling neighborhoods and not make the problems worse? How do we provide housing for people earning "minimum wage" and how do we make sure those workers can even get to their jobs? And how do we do all this while preserving a sustainable planet for future generations? These are the questions I want to discuss on Tuesday evening. My initial ideas are in my 2019-2022 Policy Platform but I want to hear your thoughts! To get the conversation started, I have invited several special guests to speak about one of the specific issues - why we should and how we can build a strong public transit system for Columbia. Be sure to be there to hear how quality transit would address so many different challenges we are currently facing. Finally, I want to thank all of the generous donors to my campaign, which has raised more than $6,000 - those funds will be used to promote and support policies that will help us realize our vision for Columbia. My next Constituent Conversations will be held Sundays, February 3rd and 17th), 2-4pm at Dunn Bros. Coffee. Upcoming dates are always available at my web site.